HORZE - Tough on tangles, gentle on skin ! Give your horse a massage with this excellent antistatic brush. 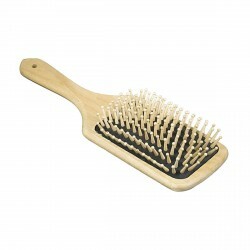 HORZE Mane and Tail Wood Handle Brush is a great brush for detangling the mane and tail ! Gentle on your horse but tough enough to get out stubborn tangles. A nice wooden handle gives this brush a sturdy feel.